CARIBOU - The Northern Forest Products Industry Cluster, which represents manufacturers, logging companies, landowners, financial institutions, economic development, higher education officials and industry experts, has voted to write a letter in opposition of the proposed Katahdin Woods and Water National Park. The cluster, meeting as a full group for the fourth time Wednesday June 4, took the action after a majority vote to draft an opposition letter. The draft will be distributed to cluster members for individual and/or company signatures. The group, organized by the Aroostook Partnership for Progress, met for the first time in January to discuss opportunities and challenges. The second meeting in February was to solidify the inputs, set up a timeline and to set and refine the priority focus areas. Meeting for the third time in April, cluster members moved closer to implementing an action plan by forming subcommittees to develop strategies in six areas: workforce development/education, transportation, energy, access to capital/insurance, state bureaucratic barriers and long-term economic plan for Maine. At the latest meeting, the cluster also agreed to form a research and development subcommittee as this is an area that will be essential for adding new products and processes to the future of this sector. "There are many indicators that show the global market for forest products overall is increasing but that market is also changing due to many factors - just as the pulp and paper industry has changed over the last 10 years, new uses and demands for wood fiber are emerging every day," said APP President Bob Dorsey. "In fact, we discussed at the last meeting how the demand for cardboard has increased dramatically with the advent of internet sales and learned that computer chips can now be manufactured from Nano cellulose fiber technology. Clearly, the R & D efforts at the University of Maine, collaboration between them and the forest sector, and the creation of new products and more streamlined processes will play a pivotal role in the future of forestry in Maine." The cluster also heard an update on the potential spruce budworm problem from Maine Forest Service State Entomologist Dave Struble. "The budworm situation is already severe north of the St. Lawrence River in Quebec, and it is not long before it will be a problem in Maine," he said. Struble said it is too soon to tell how severe the outbreak will be, but an analysis by the University of Maine looking at a moderate outbreak for budworms indicted a 22 percent reduction in harvest and a potential loss of 596 jobs in the forestry sector. Unlike in the 1970s, Struble said targeted harvesting, not widespread aerial spraying, may be the best option for combating budworm. "The Forest Products Cluster is an energetic and dedicated group and their effort was just featured in the June 1st edition of MaineBiz," commented Dorsey. "It is clear from state agencies and emails I get, that folks all over the State are following our efforts and are very supportive of the actions we are undertaking." The next full cluster meeting will be in August, when a formal action plan to grow the forest economy will be presented. Editor's note: Neither APP nor NMDC has taken a formal position on the proposed National Park. AROOSTOOK COUNTY - A businessman whose love of The County and his hometown lead him to start a business in the Shiretown in 2012 is now, three years later, the 2015 LEADers Encouraging Aroostook Development Aroostook Entrepreneur of the Year. 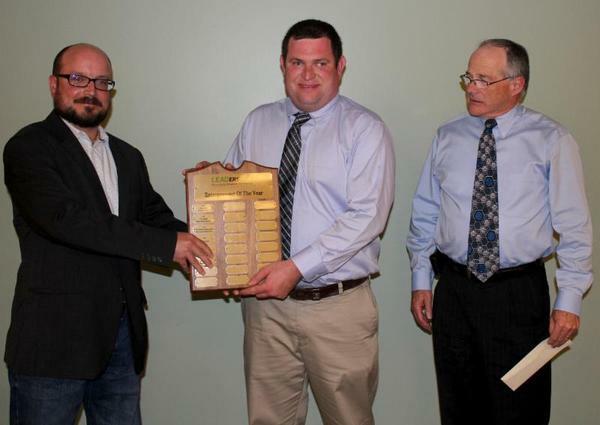 At a banquet and awards ceremony Thursday, May 28, at Northern Maine Community College Joshua McLaughlin of J. McLaughlin Construction LLC in Houlton was bestowed the honor, topping first runner up Dale and Mark Chamberland of R.F. Chamberland in St. Agatha and Brian Plavnick of G-Force Laser Tag in Caribou, who was second runner up. "We had 12 outstanding nominations and the selection committee did a good job getting it down to the three finalists," said LEAD Executive Director Ryan Pelletier. Joshua McLaughlin, of J. McLaughlin Construction of Houlton, is presented the Aroostook Entrepreneur of the Year plaque from 2014 winner Cory LaPlante of Northern Prosthetics and Orthotics. Also pictured is Jim Davis, President of LEAD. In his presentation to the approximately 65 people in the audience, McLaughlin said this award is only made possible due to the hard work and dedication of his employees. He also thanked the many people who supported him as he grew the earthwork business. McLaughlin has also grown his operation by recently purchasing Dickinson and London, where he was formerly employed. The purchase has enabled McLaughlin to move his operations into a more spacious and visible location on Bangor Street. In addition to growing his business, McLaughlin is the president of the Greater Houlton Chamber of Commerce and vice-president of the Southern Aroostook Development Corporation. He resides in Houlton with his wife and three children. "We can be extraordinarily proud of every person and organization participating in this year's recognition and awards," said LEAD President Jim Davis. "This event enables us to celebrate and recognize the folks throughout The County who are putting it all on the line for an idea, product or service about which they are passionate. Entrepreneurs are the business people who see an opportunity and move to fill a need. They remind us that The County's economy is not dead, but has a vibrancy and growth that simply takes a bit more effort to find." Other nominees included: Andrew Birden of Fort Kent (Fiddlehead Focus), Jenny Gagnon of Frenchville (Avon Consultant), Andrew Marquis of St. Agatha (Marquis Tree Works), Joe and Greg Hedrich of Presque Isle (Northeastland Hotel, Bonanza Restaurant and Town and Country Apartments), Dave DeMerchant of Presque Isle (Rosella's Restaurant and Northeast Trophy and Norogala Show Ribbons), Jonathan Kelley of Presque Isle (CompetitorME), Amy Murphy of Presque Isle (Amy's Flowers), Patrick Vaillancourt of Van Buren (Northern Turf Management) and Ricky Nadeau of Madawaska (County Connection Pub and Nightclub). A panel of six judges, representing LEAD and the supporting organizations, Husson University, Northern Maine Community College, the University of Maine at Fort Kent, the University of Maine at Presque Isle and the 2014 Aroostook Entrepreneur winner Cory LaPlante of Northern Prosthetics and Orthotics, selected the 2015 finalists. Emcees for the awards banquet were Jason Parent and Ginny Joles, who have served in the same capacity since the competition was first held in 2009. Past winners include, David Harbison in 2013 (Bison Pumps), Scott Galbiati and Jessica Jewell (22 Vodka) in 2011, Troy Haney (Haney Building Supplies) in 2010 and Matt Bell (Northeast Pellets) in 2009. AROOSTOOK COUNTY - For over a decade, Maine oral health stakeholders and concerned residents have been developing a comprehensive plan to respond to the dramatic shortage of dentists in Maine. With 15 of its 16 counties identified as dental health shortage areas and a high percentage of its practicing dentists reaching retirement age within the next five to 10 years, Maine received a much needed boost in heading off its dental crisis in 2013 with the opening of the University of New England's College of Dental Medicine, the first dental college in Maine and all of northern New England. UNE has now partnered with KeyBank to take strategic steps toward building a robust dental workforce pipeline for Aroostook and Penobscot Counties, two geographic areas of specific oral health need. With a generous grant of $160,000, KeyBank has made possible the Key to Oral Health program, an ambitious initiative with a long-term goal of encouraging select UNE dental graduates to practice in these underserved counties upon graduation. To read the rest of the Bangor Daily News article, click here.